Does this look like a meteorologist to you? If you grew up in America, you’ve probably heard it all your life: “If the groundhog sees his shadow, it’s six more weeks of winter. Otherwise, it’s an early spring.” Strictly going by the calendar, we’re getting six more weeks of winter after February 2, since that’s more or less the exact middle of winter (so it’s six and a half more weeks of winter, technically). So will we or won’t we get warm weather in early March, and see crocuses poking their heads up before expected? Almost certainly, due to global warming. But this groundhog business predates global warming, so what’s the idea in the first place? Sound familiar? Basically, if it’s sunny on Candlemas, winter will continue as usual, but if it’s cloudy on Candlemas, it’s an early spring. And if it’s cloudy, what doesn’t happen? The groundhog (and everyone else) doesn’t see its shadow! So how did groundhogs, North American animals, get mixed up in this very old European tradition? It wasn’t always a groundhog, of course. Older traditions use a badger or a bear. Both animals are indigenous to North America, but for whatever reason, when the tradition came to America, it transformed to a celebration of the groundhog. A shopkeeper in Morgantown, Pennsylvania is cited in the first written reference to weather prognosticating groundhogs in America. 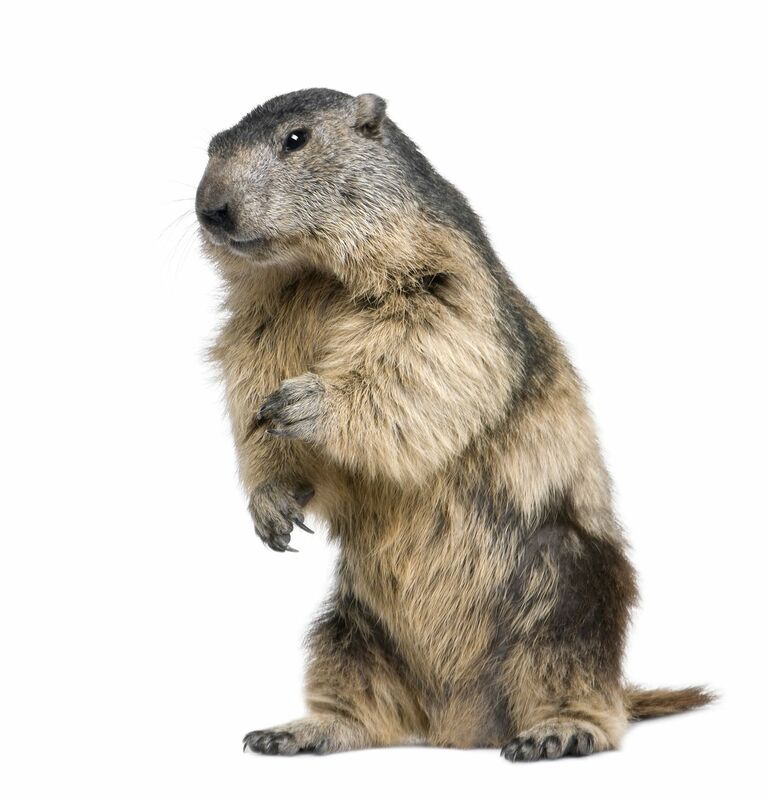 The shopkeeper noted in 1841 that German immigrants to Pennsylvania believed that if the groundhog came out of his burrow and didn’t see his shadow, it would be an early spring. As Germans and their descendants spread out across North America, so too did the groundhog legend. Groundhogs are found all over the eastern half of the United States and in much of Canada, and even in parts of Alaska. Meteorological groundhogs, not surprisingly, appear all over these regions, as well. No one puts any faith in the the groundhogs’ ability to predict the weather any more than they put faith in the zodiac’s ability to predict one’s love life, but the fun is pretty widespread. Local groundhogs always make the local news, as do their predictions. The largest Groundhog Day event is the one in Punxsutawney, Pennsylvania, which has been going on annually since 1886. The groundhog’s name is Punxsutawney Phil, and he is greeted with much fanfare. A group of men calling themselves the Groundhog Club dress in top hats and spats, ready to party like it’s 1899, and greet Phil as he comes out of his “hole”. His “hole” is actually a hutch, and they open its door and somehow determine whether or not Phil has seen his shadow. Tradition has it that Phil would see his shadow and get frightened by it, inspiring his retreat, but with all the lights from the camera crews, it’s hard to see how no shadow gets cast. The Groundhog Club interprets what Phil tells them, claiming that they can speak “Groundhogese”, and they in turn translate it into English, in the form of verse. The Groundhog Club and Punxsutawney Phil at Gobbler’s Knob, Groundhog Day, 2016. The celebration in Punxsutawney is by far the largest groundhog celebration in North America, drawing over 40,000 attendees annually (and more if it’s on a weekend). That’s a lot of people for a remote mountain in Pennsylvania, in the middle of winter, at dawn. The festival there used to get quite out of hand, but in the 1990s, drinking was banned on Gobbler’s Knob, the mountain (well, it’s more like a hill, really,) where Phil puts in his appearance. Celebrations keep getting larger, but the enforced sobriety make them much more manageable for local law enforcement. For the record, Punxsutawney Phil more often than not predicts six more weeks of winter. Of all his recorded predictions, they’ve been correct 39% of the time. So when you hear Phil’s results, bear that in mind. But cut him some slack: he’s been doing this for at least 122 years. That rodent’s probably exhausted.